Good old New Corn Hill. 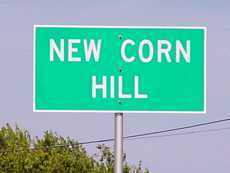 Maybe you have been to New Corn Hill and thought you were in Corn Hill, or Cornhill depending on your spelling preference and which map you're using. 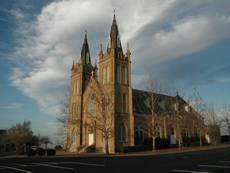 What some people think of as Corn Hill is really New Corn Hill, the place on FM 1105 where rolling pasture and prairie converge at the beautiful and historic Holy Trinity Catholic Church. Until recently there wasn't a sign on FM 1105 announcing a driver's arrival in New Corn Hill. The nearest sign was for Theon, a mile or so south. As Monk Ivicic will tell you, "Theon doesn't have anything to do with it." Ivicic, who retired from the Texas Department of Transportation last year, took it upon himself to get signs posted on FM 1105. People were getting Theon and New Corn Hill confused. The new signs are part of an attempt to put an end to the confusion. 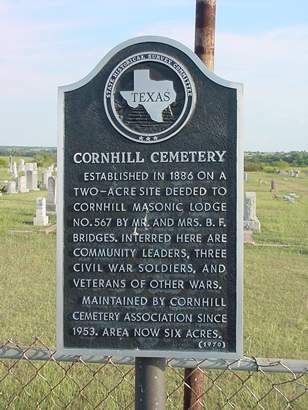 The site of the original Corn Hill community is now referred to as Old Corn Hill but is spelled Cornhill on old maps and on a historical marker at Cornhill Cemetery. 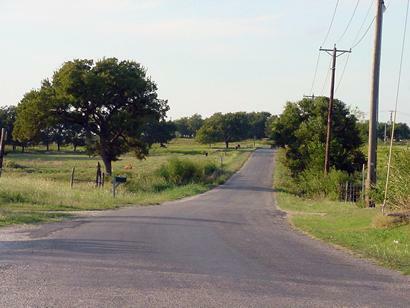 The site is on Willis Creek, two miles south of Jarrell, just east of the IH-35 frontage road. Signs alongside the frontage road today point you to the Cornhill Cemetery, but there are other remnants of the once-thriving community before you get there: a windmill, some old houses and outbuildings, and an abandoned two-story structure that was once a hotel and later a residence. These are the few reminders left of a time when Cornhill was a thriving community, back in the days before the Bartlett and Western Railroad's track bypassed the town. Ivicic says a trio of Cornhill landowners refused to grant the railroad right-of-way to the Bartlett and Western so the railroad laid its tracks just north of town. The tracks ended at a new town on the prairie, Jarrell. To say people in Cornhill packed up and moved to Jarrell wouldn't be exactly true because there was no packing to it. Instead, most of the people in Cornhill hooked their houses to a John Case steam engine and moved to Jarrell, en masse, inside their houses. "If those landowners had used logic, they would have let the railroad go through their property," Ivicic says. "Old Corn Hill would still be there." 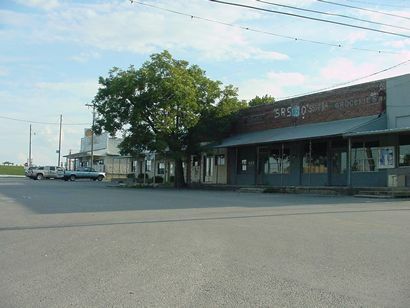 Instead, the old community has faded from view and memory to the point where a lot of Williamson County natives don't know there ever was an old Cornhill. "It was news to me," Ivicic says. "It's news to most people." Ivicic's ties are to New Corn Hill. He has researched the area's history and talked to long-time residents whose families go back generations. He has collected some amazing old photographs, including one that shows a mercantile and possibly a saloon located next to the Holy Trinity church. The buildings were owned by his great grandfather, Ignac Kubacac. 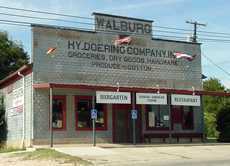 Ivicic says the unofficial boundaries of New Corn Hill extend roughly from Jarrell to Schwertner to Walburg. That includes property owned by Bill Schwertner, which was once the heart of Cornhill. The most tangible reminder of the old community is the Cornhill Cemetery, which was established in 1886. According to a plaque outside the cemetery's gates, community leaders, three Civil War soldiers and soldiers from other conflicts are buried there. Inside is a plaque next to the headstone of James G. Wilkinson, a veteran of the Battle of San Jacinto and three sessions of the Congress of the Republic of Texas. The headstone was moved to Cornhill from Burleson County. His wife, Amanda Hope, was one of the "Old 300," Stephen F. Austin's first colony. Both her body and her husband's are actually buried at the State Cemetery in Austin. The Daughters of the Republic of Texas arranged for the reburials in 1836.